For reasons both poetic and pragmatic, the tree has historically been the designer’s go-to inspiration for mapping relationships. In the graphic below, Finish-Swedish illustrator Minna Sundberg artfully uses this format to trace the world’s largest language families. 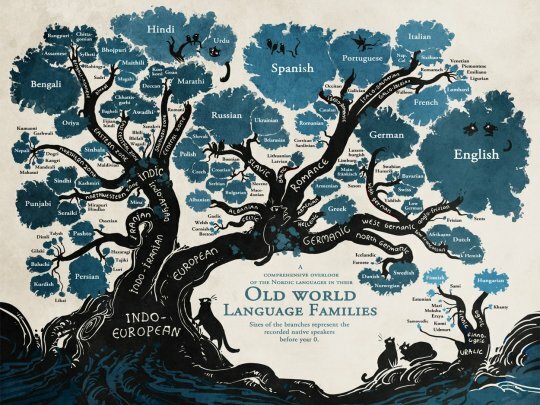 All of the languages illustrated here stem from subcategories of either Indo-European or Uralic origin, and upon closer inspection many fascinating links are revealed. One of the most surprising relationships is how distinct Finnish is from the other Scandinavian languages that share Germanic roots — a distinction that Sundberg seized upon with a separate Nordic-language comparison chart, which you can view here.